These were the word spoke to us by Guy Lhéraud as we entered Cognac Lhéraud in Cognac, France. He ought to know, as he is one of the producers the eau-du-vie known as the “water of life.” We left our city mentalities at the door and heeded his words, following him into his world. In the U.S., Cognac is best known because of four large companies. But, there are smaller family-run businesses in the area, such as Cognac Lhéraud. The Lhéraud famly has been growing grapes for 10 generations. The first six generations sold their grapes to the larger companies. 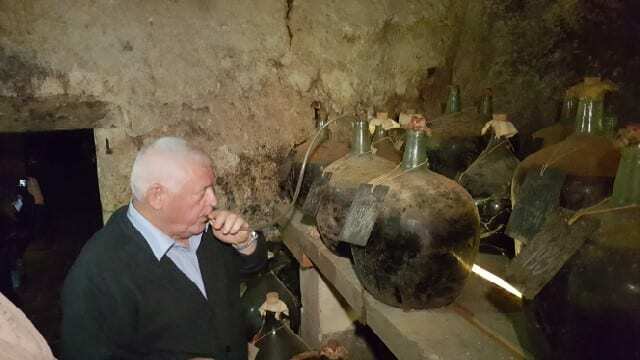 Guy Lhéraud, a jovial, old-school Frenchman who constantly has a lit cigarette in his hand, decided in 1970 to stop selling their grapes to bigger producers. They began their own label and today he runs Cognac Lhéraud with his wife, children and grandchildren. The 10th generation member is his great-grandson who is 1 year old. “We are not winemakers. We make wine for Cognac,” Lhéraud said. Cognac, made primarily from the grape ugni blanc, consists of six growing regions: Grand Champagne, Petit Champagne, Borderie, Fins Bois, Bous Bois and Bois Ordinaire. 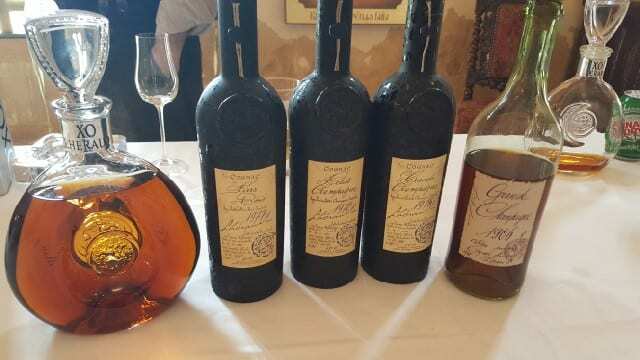 Cognac Lhéraud owns 90 hectares in Petit Champagne, as well as vineyards in Bas Armagnac, and makes 800,000 bottles each year, 70 percent of which are Cognac. The grapes are picked in mid- to late-September and pressed by machines for 12 hours. The juice is then placed in concrete tanks until December, where natural fermentation occurs. No colors or sugars are added to the product. Double distillation in copper pot stills takes place between December and March. While Guy, his son Laurent and grandson produce the cognac, the packaging was created by his wife, Andrée Lhéraud. She designed the bottle shapes, modeling some after styles from the 19th century. Madame Lhéraud also designed all of the labels, writing calligraphy by hand. She also created the ink used in the labels using acorns that have fallen in the forest around the distillery, which she makes into a powder and then an ink. She is now teaching her 25-year-old granddaughter the art of calligraphy. — VS: This is the youngest cognac, which required three years’ minimum age. — VSOP: This cognac requires five years’ minimum age. — XO: While XO is typically a blend of years and requires 15 years’ minimum age. Lhéraud does not blend different years and their XO is 40 years old. — Vintage Cognac: Made every year, vintage cognac is 10 percent of their production. It is not diluted, and is at cask strength, 46 percent alcohol. — Fin Bois 1977 is more structured, sharp and harsher, a more masculine cognac. — Petit Champagne 1970 is rounder and brighter, like a burst of energy. It is more delicate and a bit easier to drink. — Grande Champagne 1976 is delicate and spicy. — Pineau – Made with cognac and fresh ugni blanc and columbard juice, it has notes of candied fruits and nuts. — Grand Champagne 1906 is dense with citrus and spice notes. 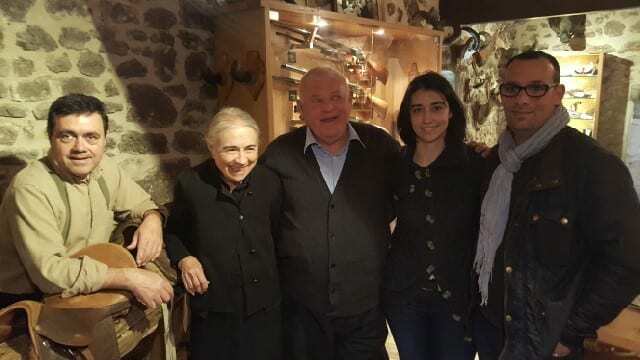 But the really special part was when he took us into his 1,000-year-old home and cellar on the property. There are elements of architecture that date back to the 9th and 10th centuries. And inside, glass casks of old cognac line the walls. One was from 1802. The pot still this cognac was made in sits on display in the distillery and dates to 1799. As mesmerizing as it was to see these old casks was, it was nothing compared to when Guy Lhéraud began to syphon the 1893 cognac straight from the cask, inviting each of us to take a turn. There was no sipping as the “water of life” poured into our mouths, filling us with warmth, and dripping down our chins. There is really no way to describe the beauty of this product other than to say that it felt like my heart was being wrapped in a soft, cashmere blanket. It was at this moment that Guy Lhéraud was able to best share his life with us. Cognac is his life. He was born in it and will die in it. It is not just a business. He breathes it. So, heed Guy Lhéraud’s words, his philosophy in life. Do not rush through life. Take your time. Savor cognac and savor life. Beer bonging cognac from 1893 in the cellar of Cognac Lhéraud was savoring life in an unforgettable experience. This entry was posted in Lifestyle, Wine and tagged cognac, Cognac Lheraud, distilled spirit, France, Guy Lheraud, Napa Valley Register by Allison Levine.